RStudio Server instance with multiple login. Apache to host a welcome webpage. Restart the server to securely load private Github R packages / Docker images. A shared cron folder that runs every day at 0630 that user’s can put their own scripts into. It is inspired by conversations with @Chipoglesby and @RichardFergie on twitter about this kind of setup, and was useful to me as a way to organise my thoughts on the subject ;). If you have any suggestions on improvements please tweet to me at @HoloMarkeD or email via the blog. I’ve just started a new job at IIH Nordic where a part of my duties is to look for ways to automate the boring tasks that come up in a digital web analytics team. IIH Nordic have an aim to introduce a 4-day work week within a couple of years, so the motivation is to find out how to save 20% of the current work schedule without harming productivity. Downloading data and creating reports is a big time-sink that looks ripe for optimisation. The current strategy is to introduce the team to R and train everyone up in running simple scripts that download the data they need for their reports. We will tackle data transformation/ETL, statistics and visualisation/presentation later, but the first goal is to solve the “How can I get data” problem. I’m well placed to help due to writing googleAuthR, so have played with R libraries with simple authentication and functions to download from Google Analytics, Search Console, BigQuery, as well as using Randy Zwitch’s Adobe Analytics package. These libraries alone cover 90% of the data sources we need. 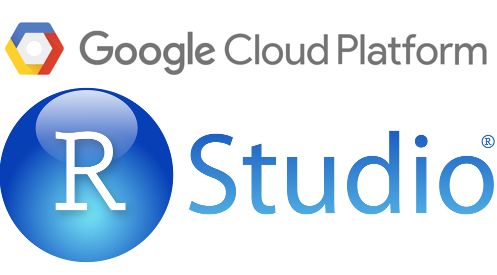 Why use RStudio Server in the cloud? Everyone is working on the same versions and libraries. Scripts can be logged for quality and errors. Scheduled scripts can be run from the server not someones local PC. Training material can be made available on same server. Web accessible private login for remote working. Can use R from an iPad or Google Chromebook! I have a old blog post on the installation of RStudio Server on GCE, but this will update that since technology and my understanding has improved. Docker is a virtual machine-lite that can run on anything, which means that the set-up is very transferable to other operating systems like Windows or OSX. It offers easier set-up via pre-created Docker images, and is embraced and well supported by Google via its container registry, giving you unlimited private repositories, unlike Docker Hub that gives you only one. It provides reproducibility and scale. Github is the go-to place to review and share code, and offers web-hooks that means it can push updates when you update a repository. Every coder should use a version control system so its good practice to introduce it to the team, and it also allows installation of experimental and private R packages via devtools::install_github command. Google also has support for using Github via its Cloud Source Repositories. The up-and-coming pretender to AWS’s cloud computing crown, the Google Cloud is a natural choice for me as it offers integrations for Google Analytics and BigQuery. The server images it offers have a great API and user interface, and it offers very quick I/O and restart times on Google’s world-class infrastructure, and the Docker container support as mentioned makes things more simple to scale in the future. Restart the server to load your private Github R packages if you have any. A shared cron folder that runs every day at 0430 that user’s can put their own scripts into. In general I use the command line from a local terminal, but all actions can also be carried out within the Compute Engine web interface. Here is a reference for GCE docker enabled VMs. Unlike previously, this new (from Aug 2016) container ready VM comes with Google Cloud Storage scopes already set, so you can use private docker repos. The --tags flag sets the default http firewall rules to apply to this instance so we can reach it via the internet on port 80. Anything new in the Docker container will disappear on a restart if you also don’t commit and push the image, so to avoid that data and scripts are linked to the container via the --volumes command. We also link to persistent disk rather than the VM’s own, which has the advantage of being able to connect (read-only) to multiple servers at the same time, should you need it. This also means if you need a more powerful server, you can safely create one knowing you will have the same data and scripts available. We are now making commands from within the GCE VM. See here for more diagnostics help. 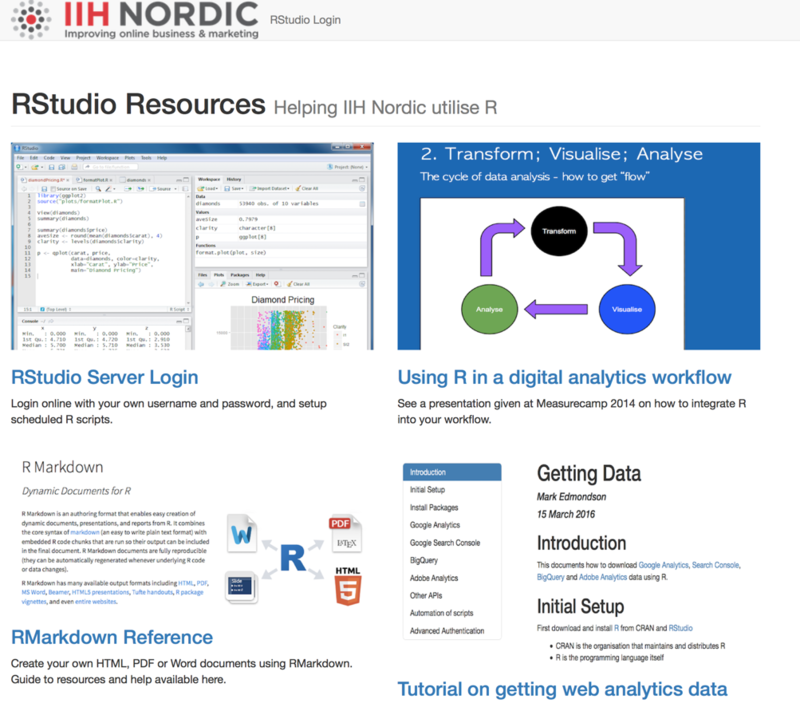 This gives you a user-friendly webpage pointing to the RStudio login, and I also use it as a place to put training material such as RMarkdown documents. I suppose this could also be done via another Docker container if you have a more complicated Apache setup to use. The ProxyPassMatch line is needed for the Shiny engine thats within RStudio Server to work. You should now be able to see your server running Apache. Now, you may want to have a dropbox style folder for the data your scripts are running, say scheduled data downloads. There are a few ways to skin this cat, such as uploading to cloud storage in your script, but the simplest way for me was to use the Apache functionality to create a logged in download area. Update your Apache config to have logged in access to the folder. The extra Apache config is below. It requires installation of sudo a2enmod headers and a restart. We first download a pre-prepared RStudio Docker container created by the Rocker team led by Dirk Eddelbuettel. 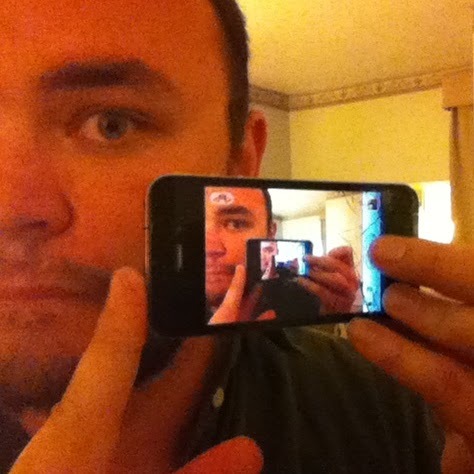 This is what our custom image will be based upon. Here we download a variant that also loads RStudio and all of Hadley’s packages to give us a great base to work from. Most of the below is gleaned from the Rocker Wiki. The below docker command runs the docker image - if that image is not available it will look for the image on Docker hub and download. This will take a long time as it downloads everything, perhaps time to put the kettle on. Subsequent times will load quickly from local version. We run it with a custom username and password we want, as this will be exposed to the web and we don’t want the defaults to be exposed. Now it could be that you are done from here - you should have a working RStudio interface available on the IP of your container (http://your-vm-ip-address/rstudio/auth-sign-in). But we will configure it a bit more, adding users, more packages, and scheduled jobs. If you have a lot of configurations then it is better to create your own DOCKERFILE and build the image yourself. This is a good one to remember for when you are doing future customisation. You are now in the Docker container. Install stuff then CTRL-D to come out again to commit and push your changes. sudo su - -c "R -e \"install.packages('abc', repos='http://cran.rstudio.com/')\""
sudo su - -c "R -e \"devtools::install_github('MarkEdmondson1234/bigQueryR')\""
sudo su - -c "R -e \"devtools::install_github('MarkEdmondson1234/privatePackge', auth_token=YOUR_GITHUB_PAT)\""
A big reason to have a server is for the team to schedule their data fetching scripts. We achieve this by running CRON within the Docker container (to ensure all packages are installed) and then providing a link to a folder that runs the script when they need it. We can then schedule scripts via RScript to run daily. The r-cron.R script needs to have #!/usr/bin/Rscript at the top to run correctly. Repeat for all scripts you want to run. There is also an R package that manages cron, cronR , which now has an RStudio Server addin, which looks like a good option. We now commit and push changes to the Google Docker Hub. The Docker command docs are here. …but this will be taken care of in the startup behaviour below. Remember to commit any changes each time you change the configuration of RStudio. Now we want to configure the above to happen everytime the VM starts up. I use a startup script for pulling the latest docker image and updating any packages or data from github so to refresh I just need to restart the server. In the custom metadata for the VM, we need the field startup-script and then optional other metadata. The metadata is kept seperate away from your running containers, but available via the Google metadata commands. This can be used for things like passwords and security settings you would prefer not to be shipped in a Docker container, and is easier to manage - just edit the metadata keys. This startup script loads the metadata above and downloads custom R packages and data files from github. You can save this locally as startup.sh and upload via gcloud or paste it into the interface into a metadata field called startup-script. sudo su - -c "R -e \"devtools::install('/home/R/localPackageName/')\""
You could also have a shutdown-script that would execute before any shutdown. Check out the list of metadata you can pass into scripts. Now we relaunch the newly configured VM from your local computer, to test the startup script works. This will copy over all the configurations from the RStudio server above. After a couple of minutes everything should now be running as configured before. This should put you in a great position to support R-scripts to the team, but also in a scalable way where starting up faster and bigger machines is just a case of updating configuration files. I would like to start up containers using the container manifest syntax but couldn’t get it to work for me yet, but for just one VM it means a few less lines in the start up script. We also have OpenCPU and Shiny Server in the Google project, as we move into providing data output such as visualisations, APIs and dashboards. They are setup in a similar fashion, just swap out the Docker image for the appropriate version you need.